Parkland Survivor Blasts GOP For Sending Thoughts And Prayers But Freaking Out Over "Rainbow Wedding Cake" - Joe.My.God. “This is the time to talk about guns. There’s much more that can be done, much more that needs to be done and much more that people like Sen Marco Rubio and Governor Rick Scott are not doing. It’s scary to think these are the people who are making our laws when our community just took 17 bullets to the heart. “It feels like the only people who don’t care are the people making the laws. 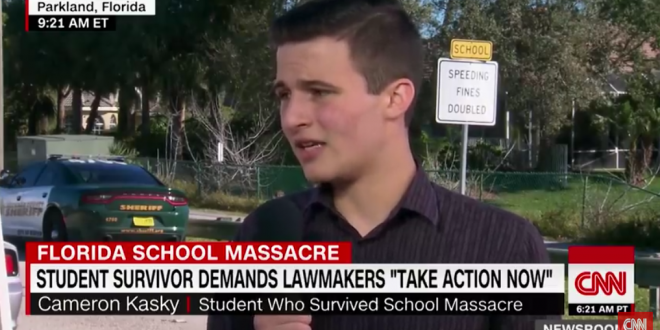 There is a segment of this society that will shrug this off and send their thoughts and prayers but march for hours if they have to bake a rainbow wedding cake.” – Parkland student Cameron Kasky, speaking today to CNN’s Anderson Cooper.